Awarded for excellent progress in their level 2 NVQ in Business and Administration. Well done Nathan from all the team at ACO! Da iawn! Welcome to the ACO Training Ltd Moodle! Moodle stands for Modular Object-Oriented Dynamic Learning Environment. In a nutshell, this means an internet accessible learning resource. 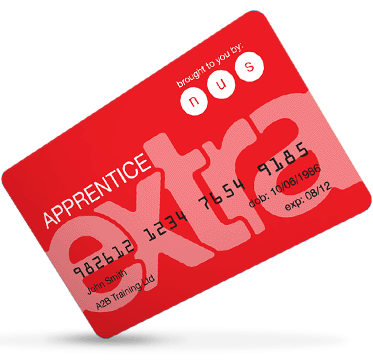 You can access paperwork and useful information about your apprenticeship here. You can contact us via email here and also get information on our news and calendar areas such as examination dates and upcoming events. If you need Moodle assistance, ask any member of ACO staff. If you are aged between 16-18 years you can apply for your my-travel-pass via Gov.wales/mytravelpass (English) or Llyw.cymru/fyngherdynteithio (Welsh). It will enable you to receive discounted fares on all local buses and TrawsCymru journeys throughout Wales. Skip Your Vote Matters! Use it! Your Vote Matters! Use it! 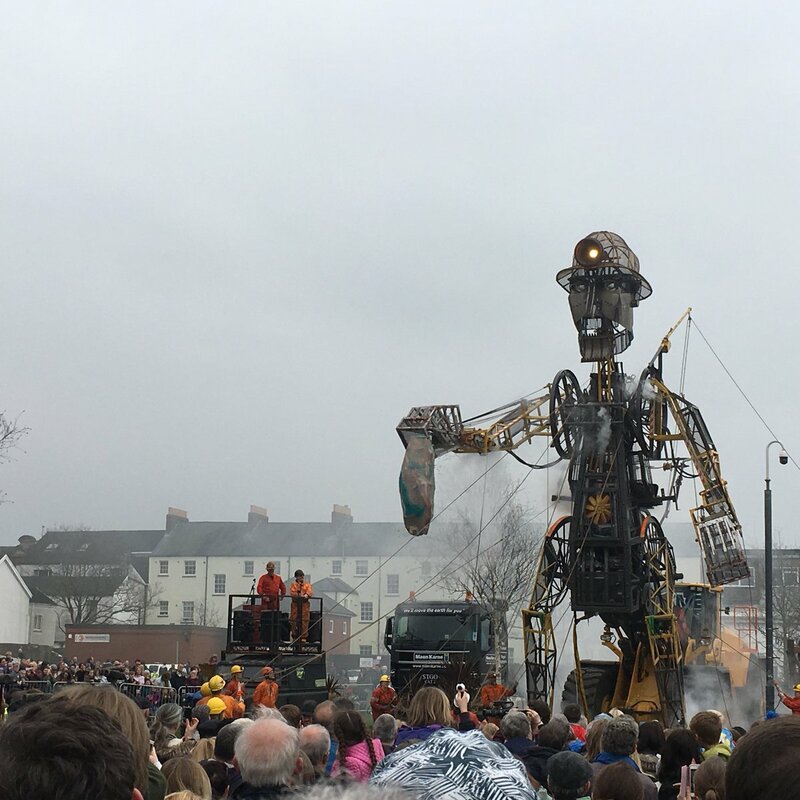 Great for ACO Learners to witness the Man Engine’s arrival in Swansea. He came to honour the miners who had lost their lives and to celebrate all they achieved. What an incredible spectacle watching him come to life! #ManEngineCymru . Skip PREVENT & WRAP - what is it all about? PREVENT & WRAP - what is it all about? PREVENT is the name of the government strategy to help prevent terrorism. It also aims to prevent vulnerable people from getting drawn into terrorist groups or radicalisation. WRAP stands for Workshop to Raise Awareness of Prevent. ACO staff have conducted Prevent and Wrap Training to help keep our learners and staff safe. Looking to get fit but don't know where to start? NHS Choices have developed a 9 week plan to get you from couch potato to 5K runner! To download the app and for more information, click on the image below. Barclay's Life Skills aims to help you to unlock the skills and experiences you need to get the job you want. Follow the link below for information and resources about choosing a career path, applying for jobs, succeeding using people skills and managing money. Skip ACO attempts the 3 peaks!!! 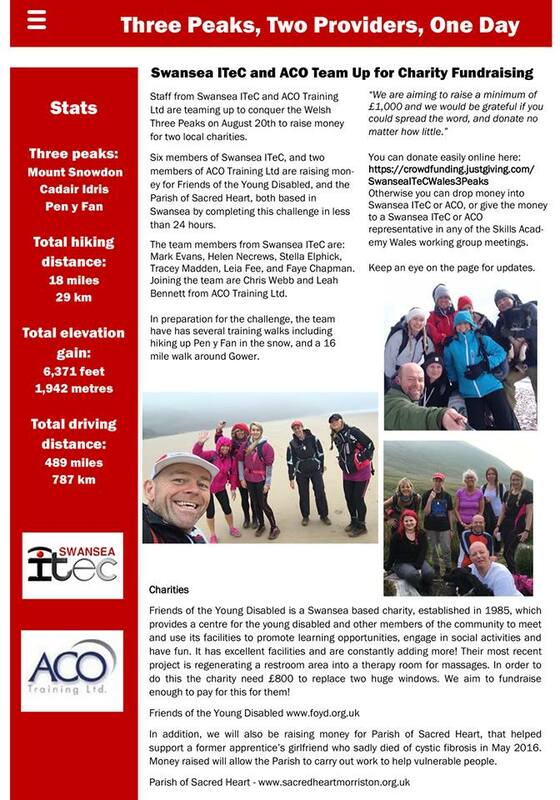 ACO attempts the 3 peaks!!! One lucky person can win 12 days COMPLETELY FREE gym membership at the LC2, Swansea. Ask any of our staff for details. Skip How are we doing at ACO? How are we doing at ACO? Our mission statement at ACO Training, and in Skills Academy Wales is to deliver high quality provision for learners, employers and the wider community, to support sustainable economic growth and regeneration, through effective partnership working. In other words, we want to give YOU the best experience of work based learning. If you have any suggestions that you think will help us to achieve these aims, we would love to hear from you. There is a suggestion box in the training room at ACO, with forms for you to fill in. You can choose to remain anonymous, and your suggestions will be discussed in our staff meetings. We WILL take action to improve our training, our procedures, our customer service and to save costs.